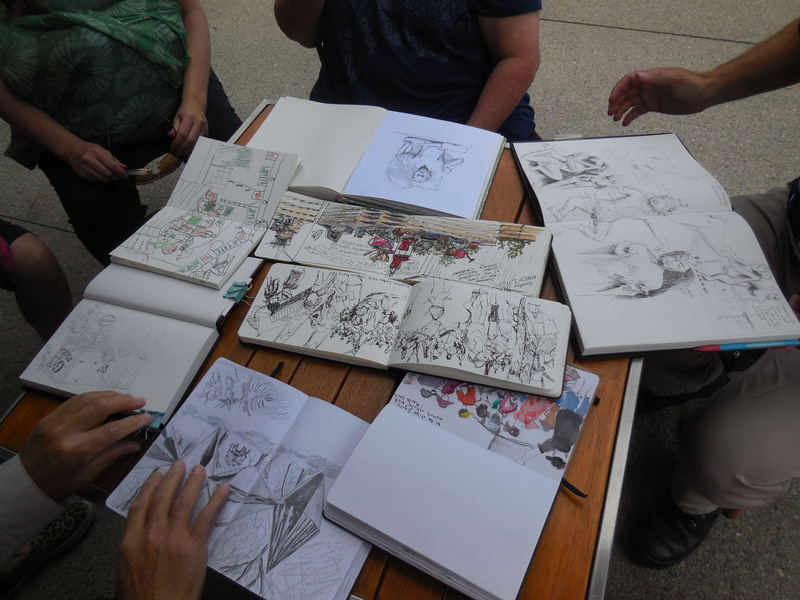 The Canberra Sketchers Group met for the second time, last Sunday, for several hours of drawing at the National Gallery of Australia. Our visit coincided with Sculpture Garden Sunday so there was plenty of activity and people to capture as well as the art work itself. We were pleased to welcome some new people to the group. As always we managed to find a variety of things to draw around the gallery. Some braved the crowds in the Sculpture Garden, some used the pop-up restaurant as their base and others drew in the Asian galleries. 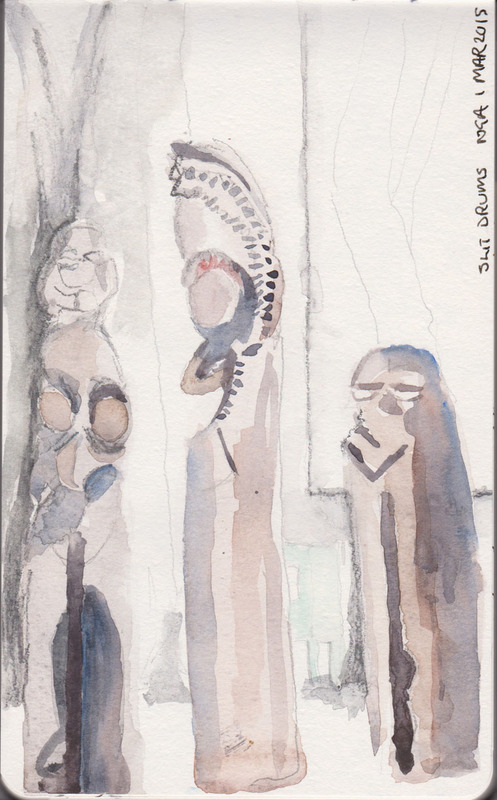 I started in the Sculpture Garden where I painted three of the slit drums from Vanuatu. I only had to turn my head to see the furious activity of the straw modelling activity nearby. 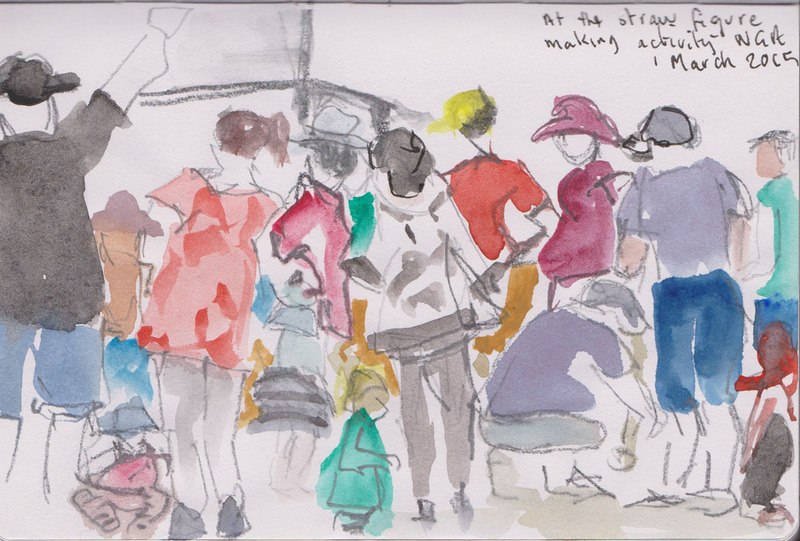 For my last sketch I tried to capture the people in the central lawn area of the Sculpture Garden. This proved to be quite a challenge as there must have been several hundred people in front of me. I decided to keep it fast and loose with pen and ink. Families in the central lawn area on Sculpture Garden Sunday, National Gallery of Australia, 1 March 2015 pen and ink. The Canberra Sketchers Group will meet again on 12 April at 10.30 am at the Lanyon Historic Homestead, Tharwa Drive, Tharwa (on the Canberra side of the Tharwa Bridge). Everyone is welcome. Here is the link to our previous outing and you can also find another perspective on the days activities by heading over to Tones and Tints. Lovely loose washes and sketch – very productive! Thanks. It was a good day.